Ashes of Ariandel is the first of two expansions for Dark Souls 3. In "Ashes of Ariandel", you will fight in Ashes of Ariandel through a snowy landscape - an environment that has not yet existed in Dark Souls 3. The terrain is much more open than fans are accustomed to, and new enemies also harbor this unfriendly environment. In addition to trees, which suddenly come to life and not only attack you with their branches but also shoot fireballs. The first boss, you’ll encounter in Ashes of Ariandel, is an over-sized wolf. It awakens memories of Sif from Dark Souls, but while this specimen was performing an impressive sword blows against you, the new boss is entirely dependent on his catches and claws to harm you. However, the DLC opponent is still protected by a human character that has to be defeated. 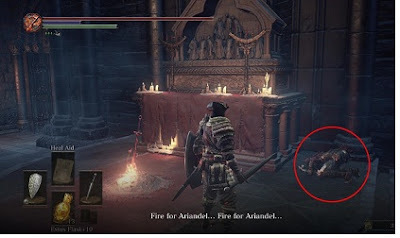 Note that if you are new to Dark Souls 3, then you will not be able to start the Ashes of Ariandel directly. To play the contents of the DLC, you must be already advanced in the main game. Those of you who already completed the Cathedral of the Deep, will need less support in starting the DLC. - First you need to defeat the Deacons Of The Deep. This is the final boss of the Cathedral of the Deep. - Go to the Cleansing Chapel bonfire and look to the right of the altar. There a monk kneels on the ground - a new NPC in the game. - The monk makes you an offer, and if you want to start the DLC Ashes of Ariandel, then you need to accept it. - If the monk cannot be found in the chapel, then simply go to the next Beacon, travel to another place, and then return to the Cleansing Chapel. Now the NPC must be there.